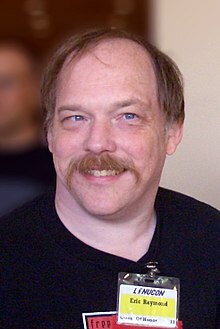 Eric S. Raymond (often called ESR; born 4 December 1957) is an American writer and computer programmer. He became famous when he picked up maintenance of The Jargon File. ↑ Raymond, Eric S. (2003-01-29). "Resume of Eric Steven Raymond". Retrieved 2009-11-23. This page was last changed on 27 January 2015, at 22:57.